I thought I would look at the earliest record in the London Gazette of someone named de Crespigny. I assumed it would be the record of a military appointment. 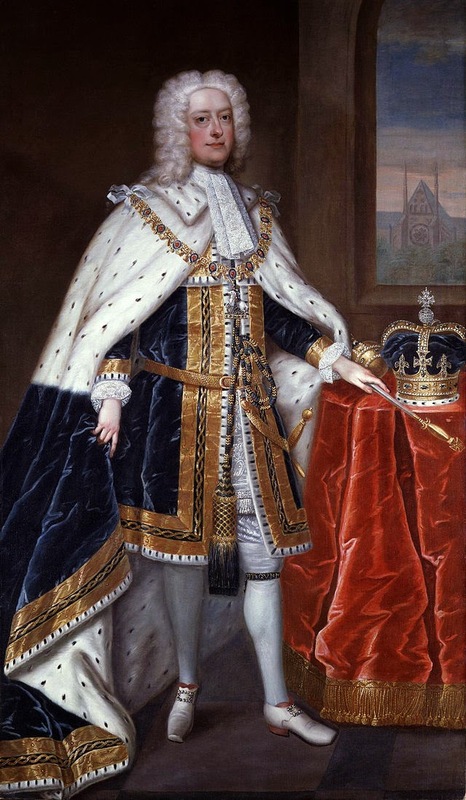 King George II by Charles Jervas painted about 1727. Photograph retrieved from Wikipedia. I realised I knew very little about my sixth great grandfather. 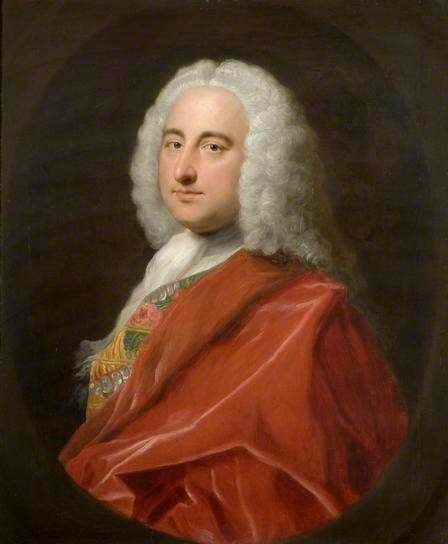 Philip was the fifth of six children of Thomas Champion Crespigny (1664-1712) and Magdalen née Granger (1664-1730). Thomas, who had been born in France, came as a boy to England as a Huguenot refugee. He served in the English military. From 1689 he was a cornet in Lord Cardross‘ Scottish Regiment of Dragoons, a Lieutenant of Colonel Richard Cunningham’s Regiment of Scots Dragoons in 1695, and Captain Lieutenant of the Marquis of Lothian‘s Regiment of Dragoons at Jedburgh in 1703.2 This regiment later became the 7th Queen’s Own Hussars. The surviving children at the time of Thomas’s death were aged 14, 12, 8 and 6. I wonder who helped Magdalen bring up her children? Was the family helped by her Granger relatives or by Magdalen’s de Crespigny in-laws? Magdalen’s mother, Marie Granger, was a widow when she made her will in 1711.7 Magdalen’s father, Israel Granger, had died in 1700.8 Marie Granger left her estate between Magdalen and the children of another daughter, Marthe. Marthe had married Florand Dauteuil in 1699, at the Savoy Church in the Strand. Marthe had died before 1711 when her mother made her will. Mary Granger’s will was proved in 1713. It appears that Magdalen had no adult relatives on the Granger side of her family to support her. Thomas’s older brother Pierre (1662-1739) was a lawyer. In her will, Magdalen leaves Pierre 200 pounds.9 In his will Pierre makes Philip and Claude his executors and leaves them one hundred pounds each.10 Pierre was the godfather of Claude, Magdalen and Thomas’s youngest son. Pierre did not marry and had no children. I think it very likely that Pierre helped Magdalen to raise her children. Although we do not have the details, it would seem that the education of Claude and Philip enabled them to be successful: Claude as secretary of the South Sea Company, a major British trading company; Philip as a lawyer, who eventually became a proctor to the Lord Admiral, in addition to holding several directorships. Philip and Claude had very successful careers despite the untimely death of their father and the fact that both their parents were Huguenot refugees.